The led tv ua43n5380 smart TV is manufactured by Samsung and was added around July 2018. This version of the TV comes in Display Technology : LED , Special Features : Without 3D , Special Features : Smart TV , Display Resolution : Full HD. 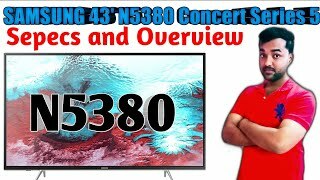 Samsung 43 Inch N5380 Smart FHD TV Detail Explanation with Overview I Best Full HD TV under 40000.